My last batch of marmalade was a study of the pure taste of Meyer lemons. This fruit is such an enticing mix of sweet and tart that it is an excellent partner as much as a starring ingredient. I was intrigued by Rufus & Clementine’s CherryMeyerGingerLade mixing together Meyer lemons, dried cherries, and fresh ginger. In fact, I was already chopping a handful of dried cherries when I had a moment of inspiration. Back in summer, I squirreled away basket after basket of sour cherries in the freezer, all meticulously pitted by hand to keep them as intact as possible. I had visions of cherry pies in winter when the days are short, a special treat that guarantees to put a huge smile on B’s face. Well, winter is half over (yes!!) and I have yet to deplete my sour cherries supply. Just why exactly would I use dried cherries in a marmalade when I have perfectly juicy ones in the freezer? 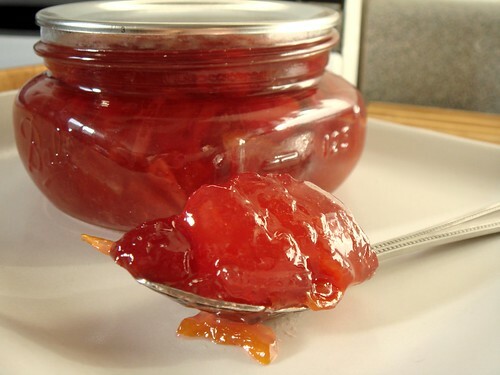 That’s how my Sour Cherries Meyer Lemon Marmalade came about. One of the reasons I enjoy BAKED Explorations so much is the enthusiasm of its authors Matt Lewis and Renato Poliafito. Take the Double Chocolate Loaf with Peanut Butter Cream Cheese Spread for example. The boys from BAKED made such a convincing bid for chocolate-as-breakfast that I cannot imagine enjoying this intensely chocolaty cake at any other time of day. Of course, the wildly delicious recipes is the other huge draw for this cookbook too! Although the recipe calls for topping the sliced chocolate cake with peanut butter cream cheese spread, I had another idea in mind. I have no doubt that the cream cheese spread is delicious because I made something similar very recently. I highly recommend it! When I think breakfast, marmalade immediately comes to mind. Chocolate and orange? Sign me up! I have a long love affair with Jacob’s Orange Club and it just so happens that I have a huge craving for some now. To emphasize the orange flavour, I rubbed orange zest into the granulated sugar of the cake. 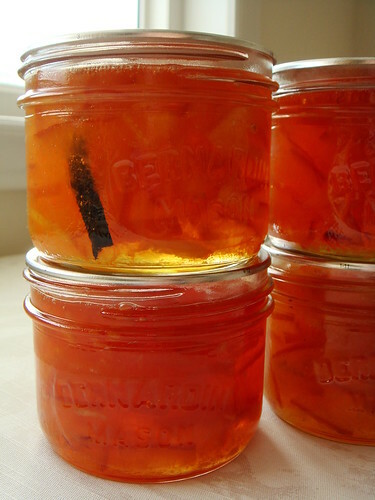 As for marmalade, I slathered on some of my homemade Seville Moro Marmalade. 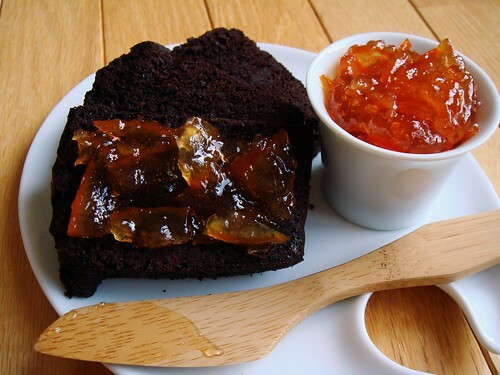 Since the chocolate cake has such a deep chocolate taste from cocoa powder and chopped dark chocolate, the tart and slightly bitter edge of the marmalade really brighten up the taste. I prefer to slice the cake rather thin, about 1cm thick. After talking about making Meyer lemon marmalade for a week, one batch is finally done and I’m proud to say it is my best work yet. In marmalade-speak, my last two batches of Seville orange marmalades were medium cut with chewy peel in the more traditional bittersweet style. Meyer lemons are famous for their delicate sweetness and I want to make a marmalade that emphasizes on this quality. First, the bitter pith had got to go. I don’t want bitterness to interfere with the sweet tart taste of the fruit. Next to tweak is the texture. When I think delicate, I imagine thin slivers of peel weaving with juicy pulp in soft jiggly jelly. Last but not least, no fancy pants flavouring to obscure the natural taste of Meyer lemons! The photo doesn’t do it justice. When I scooped a little of the marmalade into a spoon, I fell in love. It wobbled slightly with every breath I took and reflected the winter sunlight in its golden hue. The taste was pure Meyer lemon and those thin slivers of peel soft and flavourful. 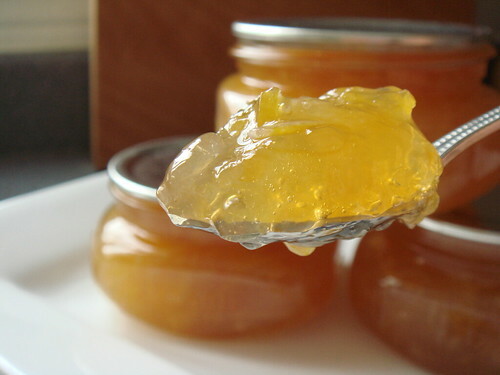 This marmalade is refined and would be a great match for English muffins or crumpets. I want to name it “Jiggly Sunshine” but it seems almost too goofy (not that naming my food is not already goofy enough). Do you have any good suggestions? Ever since I had my first taste of chicken b’stilla from Cafe Moroc in Toronto, I’ve been enamoured by the harmonious blend of sweet and savoury of Moroccan cuisine. Oddly enough, when I traveled to Morocco a few years ago, I never ordered this dish despite all the other delicious food I enjoyed. 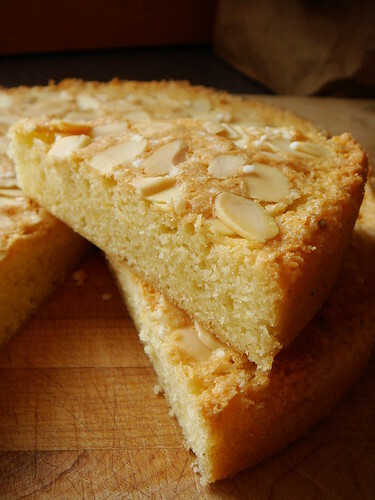 This week’s French Fridays with Dorie gives me the perfect excuse to recreate this personal favourite right in my own kitchen. 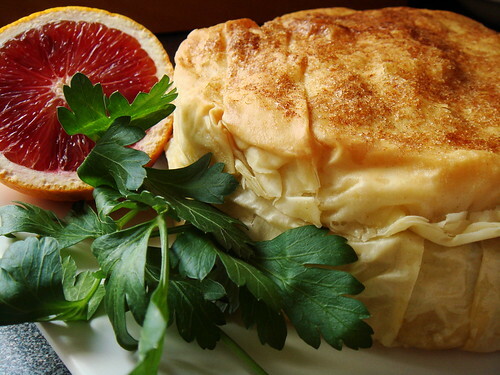 A few key characteristics of chicken b’stilla include flaky phyllo pastry, shredded chicken fragrant with sweet and savoury spices, toasted almond, custard sauce, and cinnamon sugar on top. Greenspan’s recipe covered it all. The cooking can be a little involved but the work can be easily split over a couple of days. My favourite part of this recipe is the filling. Do you know how hard it was to stop myself from eating the filling by the spoonful? Flavourful chicken thighs and onions were simmered in an aromatic broth infused with Kashmiri saffron, coriander, cinnamon, and chicken stock. The broth was then reduced and thickened with eggs into a custard sauce. I’m so glad that someone suggested in the P&Q to temper the eggs! Deviating slightly from the directions, I did not add salt to the broth until it was thickened to custard because the reduction would throw off any initial seasoning. The chicken, onion, and custard sauce were tossed together with parsley and cilantro. 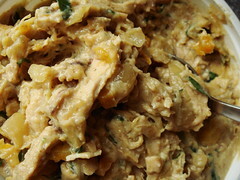 At this point, I added orange zest and finely chopped dried apricots to further highlight the sweet side of this recipe. When you think of muffins, do you picture a sweet morning treat that is barely more virtuous than a frosted cupcake? Sadly, that’s often what they are at stores and coffee shops, oversized cupcakes without frosting. I’m guilty of baking my fair share of decadent muffins too only I make them in more sensible sizes. Every time I walk by the bakery aisle of my favourite warehouse grocery chain, I’m still amazed that anyone would buy those ginormous jumbo muffins packed with half-a-day’s worth of calories for an average adult. I remember many years ago when my family first got our warehouse club membership, we purchased a dozen for the sake of novelty. My mom split a muffin to quarters and would eat one piece everyday. Needless to say, we never did finish the dozen before it went stale. That was the first and last time jumbo muffins landed in my home. What about savoury muffins? Instead of fruits and nuts and chocolate and caramel, muffins that are studded with cheese and vegetable and perhaps even some bacon or sausage? I have no doubt that these are not any healthier than their sugary counterpart but at least they are more balanced on the nutritional front. I’m quite smitten by savoury muffins myself. Because of its inherent flavour profile, I can easily remove the sugar from the recipe without missing the taste. Savoury muffins also lend themselves better to be made with alternative flour because my taste buds are not expecting a bite of tender cake. Not everyone is keen on a hit of sugar first thing in the morning. 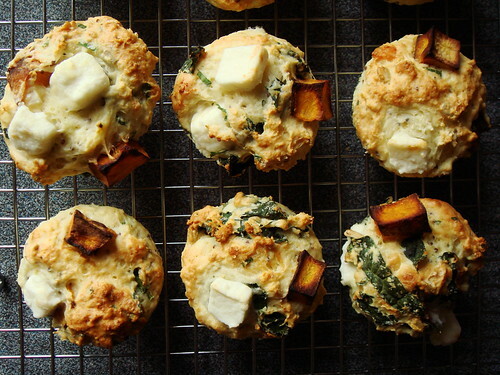 Savoury muffins offer an on-the-go alternative to the traditional eggs and meat breakfast fare. Dairy-free puree vegetable soup is a wonderful staple in my fridge because it is so warm and satisfying without the caloric burden. I crave steaming bowls of hot soup in winter so of course variety is always welcomed. As much as I like celeriac prepared as céleri rémoulade, I can only eat so much mayonnaise-laden grated vegetable. 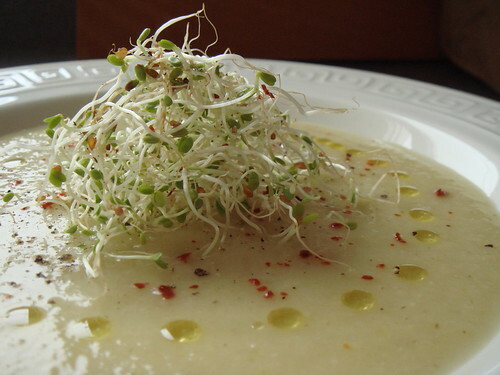 The Celery-Celery Soup from Dorie Greenspan’s Around My French Table is an interesting soup highlighting the vegetal flavour of this supportive player. It blends the sharp freshness of celery stalk and mellow sweetness of celery root with the help of onions, leeks, and golden delicious apples. Adding leeks is actually my adaptation because I’ve been stocking my fridge with leeks on a regular basis. It’s such a versatile ingredients when it comes to making soup. I deglazed the pot with a bit of white wine and replaced the chicken stock with vegetable stock to make this soup vegan. The part I enjoyed most about making this soup has got to be pureeing with my immersion blender. Ever since it re-entered my cooking life a month ago, I’ve been using the immersion blender on a regular basis to make creamy smooth soup. I really can’t imagine cooking without it again. Putting up my summer bounties in jams and jellies was such a sweet experience I could not imagine waiting a whole year before doing it again. Luckily, I don’t have to. Winter preserving is now in high gear with the huge selection of citrus available everywhere I shop. It’s not local, obviously. But then Canada is not exactly a citrus growing region either. I remember reading an article on practical locavore and it suggested a compromise to eat in season fruit and vegetable during winter that are not cultivated locally. I like advices based on common sense. When I heard about a friend’s experience with making her own Seville orange marmalade last winter, I made a mental note that I would have to try making some myself. Seville oranges are not readily available in grocery stores in Toronto because they are too bitter and sour for eating straight up. However, as long as you know where to look when the time is right, they’re not elusive either. I bought mine from Highland Farms, one of my favourite grocery stores for produce, not just for their prices, but also for variety and quality. It was quite a sight when I filled my shopping basket full to the bream with Seville oranges, Moro (blood) oranges, Navel oranges, Meyer lemons, and regular lemons. Remember my fascination of food with funny names? Here is another one: bubble buns. Say that three times fast and you may understand why it was another recipe that I just had to try. 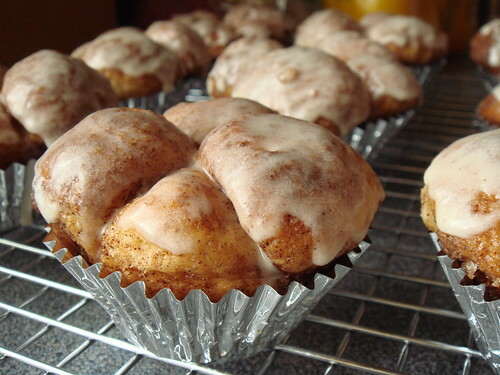 If you’re into the whole cute factor, bubble bun is a miniature version of monkey bread. As for those who do not care much for such cuteness, it is really a cinnamon roll in a different shape. I made mine according to Flo Braker’s recipe in Baking For All Occasion, a most delightful cookbook full of Braker’s unique twist on many familiar baking classics. A soft enriched buttery yeast dough is shaped into bite size balls. This sour cream dough is not the easiest to work with because it is so rich. Definitely work quickly and hopefully not on a particularly warm day. Dip each dough ball in melted butter and cinnamon sugar before piling into a muffin tin for final proofing. When the buns emerge from the oven complete with sweet and yummy aroma, glaze every one of them with a simple translucent glaze so no nooks nor crannies are missed. Well, when I said simple, I only meant simple to put together. The flavour is anything but from the rich combination of cream, dark rum, and vanilla. Obviously, the best part was pulling each bun apart piece by piece while it was still warm. Need I say that it was ridiculously delicious? We’re experiencing a whole weekend of extreme cold weather alert in Toronto. I can’t think of a better way to beat the chill than a hot bowl of spicy chili. Besides, for football fans, Super Bowl is coming up and chili is probably on the menu of most parties. 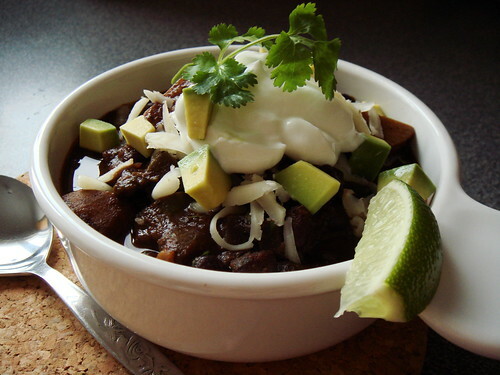 Chili is one of those dishes that inspires heated debates on authenticity and regional variations. At times, it can even be a little intimidating (there’s nothing worse than serving a dish only to be tsk tsk into a lecture of the way it should be done). What if you’re a vegetarian Texan? Do you call your chili spicy bean or vegetable stew to avoid awkward social situations? Ah, things that keep me awake at night. This may all seem long and tedious to do in one shot, and I admit: even I sometimes prefer doing things the short, easy, and less flavourful way, but the beauty of multi-step recipes is that even if you only change one thing in your routine—adding chocolate and coffee to your mix, grinding spices after toasting instead of before—the end results should be better, and isn't better food what it's all about?